We are quickly approaching a rather interesting weekend for innovation and collaborative working in the city of Leeds (7-9 March 2014). You have the choice of The Leeds Service Jam, part of the Global Service Jam or the National Hack the Gov event in Leeds, part of National Hack the Gov run by Rewired State. The Leeds Service Jam is one of over 100 events running in parallel across the globe, bringing together Jammers to make services together, over a 48 hr period. The Global Service Jam & the Leeds Service Jam are in their fourth year and each year is an opportunity for new learning in service design, making new connections and challenging ourselves afresh. The National Hack the Gov event is running in Leeds for the first time, tapping into the national event running for the past six years. Leeds is aiming to bring together thinkers, doers, creatives and designers from around the city, to look at ‘hacking the gov’ with some of the city’s newly available open data. We were a little bit frustrated because we couldn’t be in two places at once, services will definitely be involved in both events 😦 But we’ve come up with a solution, together the two events have found a way to share key event points across the weekend – Friday briefing, Saturday lunch and a shared presentation at the end of both events on Sunday. The Global Service Jam works in just the same way. But it’s not music you are Jamming – it’s change. You’ll be working with people you might never have met before, bouncing ideas off one another and building on what bounces back. People all over the world are Jamming around the same Theme, sharing insights and support globally. And it’s not just talking – you are here to turn your ideas into a concrete design, prototype and plan of action which you or somebody else might want to make real. Can you prototype and plan it in a way that someone could go out and make it real, knowing what resources they would need, what they should do, and who they should talk to? That’s the challenge of the Jam. As a group, myself, Elizabeth Peacock, Jane Wood and a team of service design supporters initiated the first Service Design Jam in Leeds. I’d met the GSJ Founders Adam StJohn Lawrence and Markus Edgar Hormess at a conference workshop in Berlin and brought back the thinking to Leeds. 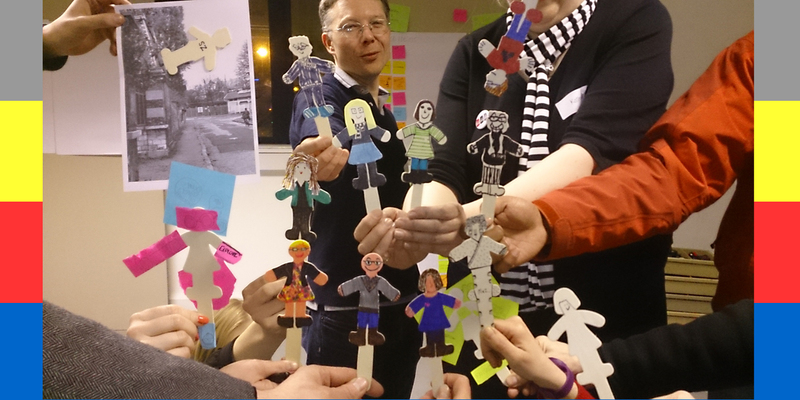 We were inspired by the ‘can-do’, ‘high-energy’, ‘collaborative’ and ‘maximum-fun’ approach… [cue: Rubber Chicken]. We learned that we were allowed to be playful in our work, and that that was a good thing. All three organisers were interested in Service Design as a discipline (still not widely understood) and to share learning with the wider community of Leeds. 25 varied attendees gave up their weekends to create three great new service prototypes but, more importantly, connect with new people and ‘learn by doing’ together. Old Broadcasting House was our venue, a perfect workshop space enabling lots of different kinds of creative working. We were kindly supported by NTi Leeds, Orange UK and free parking from Leeds City Council. The new service prototypes addressed Environment, Crime & Community needs in the city. After a steep learning curve in 2011 we decided to go ‘low key’ on event management, and had a two person jam just for fun. A Jam can be any size, just like a band jamming… it’s the free flow creativity that’s the thing. We really enjoyed jamming, working on a new service prototype for Community Development. We connected with our pals at Glasgow Service Jam, to get a wider view of activities going on over the weekend. Sometimes less can be more. We geared up again… Service Design Leeds – Thinks and Drinks (Matt Edgar & Kathryn Grace) wanted to do more ‘doing’ service design activity in the city. Together with Simon Zimmerman from Hebe Media we hosted our third event at the shiny new Duke Studios. The venue was inspiring in itself and it was a delight to be able to use the space and collaborate with Laura Wellington and James Abbott Donnelly for the first time. We had 25 attendees at the event, some newcomers and some more experienced in using service design and able to share and exchange ideas more richly. Service prototypes looked at making city shopping and leisure time easy for people growing older, a local currency that fuels exploration and an innovative playful amd fun foodbox scheme. So this year… the scene had changed again. SDLeeds had actually made a decision not to host a Global Service Jam as there was so much going on and we didn’t want to just do a repeat event. And then a door opened… Matt Redding a student architect from Leeds Metropolitan University, now working on placement at NPS Group approached us, to ask about hosting a Global Service Jam again in the city. He presented a broad picture of how he saw closed loop systems and his new discovery of service design and jamming. After his event experience in Australia, Matt was now looking to host a design event and he was keen to learn about Service Design and wanted to ‘learn by doing’. Bringing students into the event was something we had looked to do in previous years, with limited success, so this was a great new opportunity. The Global Sustainablity Jam, a sister event, held in November 2013, introduced us to Valentina Vezzani a visiting research fellow at the University of Leeds’ School of Design. Valentina jumped at the chance to be part of the GSJLeeds event for 2014. She was looking to develop ‘jamming’ further in the city and introduce us to PACO a Milan Design collaborative… for us to share in her thinking and experience. For all of us… we were interested in collaborating, allowing a little chaos into our thinking, to be challenged and develop together by Service Design jamming. So what will it be like this year? We have a mix of jamming and service design experience, leading the event. We are mixing professionals, academics and students for the first time. Like any Jam session, you don’t know… you just set things up and then let them happen. Prototyping will be the language that brings everyone together by making things with our hands – making things real, testing them with users, experiencing them ourselves, iterating and refining as we learn. We’ll be trying out different service design techniques that will help us realise initial ideas and put people and real contexts into the centre of everything we do… live, active prototyping. Although we will be interested in Leeds, we won’t limit our thinking/prototyping to the city exclusively, but be open and bring all our translations of the event’s secret theme into play. The event is supported by SDLeeds, PACO Collaborative and NPS Group. Our venue is the University of Leeds’ School of Design. We will have Jammers from Leeds Metropolitan University who will be taking part and recording the event. All the Leeds Jammers will be generously bringing their skills, time and energy. We hope to have a great time together. As part of the Global Service Jam, we will be connecting with other Jams in Manchester, Derby, Glasgow and further afield in Milan and following 100+ cities on our #gsjam twitter stream. Locally we will be connecting with the National Hack the Gov event in Leeds, to share food together and provide some exchange/collaboration time, finishing with a show and tell session at the end of the weekend. So 2014 will be a truly Glocal event, collaborating and being open. This year we are sharing the event management load wider across a new team and I’m focusing on resources, mentoring and networking with other Jams. (And chipping in here and there to keep things on track). Well for me… it’s about bringing a dream to life, a dream I had when I first left my home city of Leeds in 1989. I left Leeds thinking “I’m going to go to London, to learn my trade (as a designer) and bring it back to the city”. Twenty five years later, Leeds is now SUCH a different place, no longer the place I wanted to escape from when I was a teenager and the people are great! The old Leeds was grim, Thatcher strikes, no extra curricular activities at school… sitting on the school wall at lunchtimes in the cold. Yet my Gran drummed into me, ‘Remember where you’re from!’ and that stayed with me. I love being a global citizen, speaking other languages, connecting with all sorts of people/ideas/cultures around the world, but I also want Leeds to be the City I dreamed of… a place I want to be, a diverse and creative place to learn and be inspired. Interestingly I don’t want Leeds to be the biggest or the best, but I want Leeds to be what Leeds alone can be, unique, itself, genuine, outward looking, connecting, diverse, welcoming, celebrating difference, inspiring, playful, challenging, breaking the boundaries of geography/culture and showing us all that we can be so much more when we work together. Image: The Icebreaker Game at GSJLeeds2013, introducing ourselves as stick figures to each other, ready to collaborate and work more effectively together.